We repair, replace and renew all types of roof flashings, the most common method of roof flashing repairs now days is Lead, Lead flashings will protect abutments from water ingress but first and foremost the Lead flashings must be correctly installed. 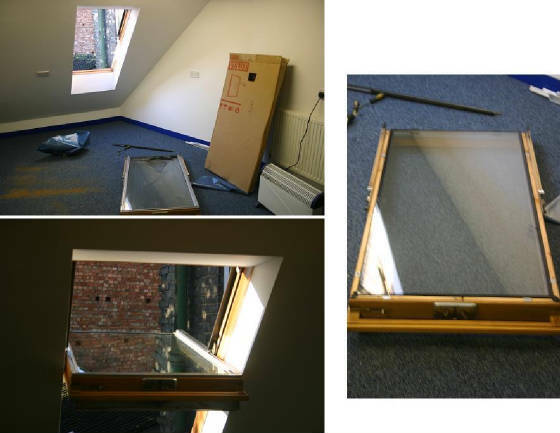 Below are a few pictures selected from the Thousands of flashing repairs we have carried out over our decades in business. Before Lead flashing were used it would have been common to use cement fillets, this method was and still is fine on older listed properties from tudor times etc, the problem with this method came in later years as heavy concrete tiles became more common and the load on the roof became greater causing movement which intern pulled the fillet away from the wall allowing water in through wall abutments, often these have patched up for a quick short term fix. The only long term repair how ever is to fix lead flashing to the wall which is more often than not stepped lead flashings. The old cement fillets will need removing and tiles broken replaced with new, all joints between brickwork will need to be chased out, code 4 Lead will be cut into Lengths to allow expansion and contraction to prevent the Lead from splitting over time. Next is to cut and bend the upstands leaving a 100mm tile covering, this Lead will now be placed ageing the brickwork marked and all steps cut out and bent to shape. The Lead flashing will now be fixed into brickwork and dressed to shape. Pointing the Lead is the final job and we always use a strong 3/1 mix and wet the chased out joint to prevent the mortar drying out to quickly which will compromise the pointing strength if this happens. 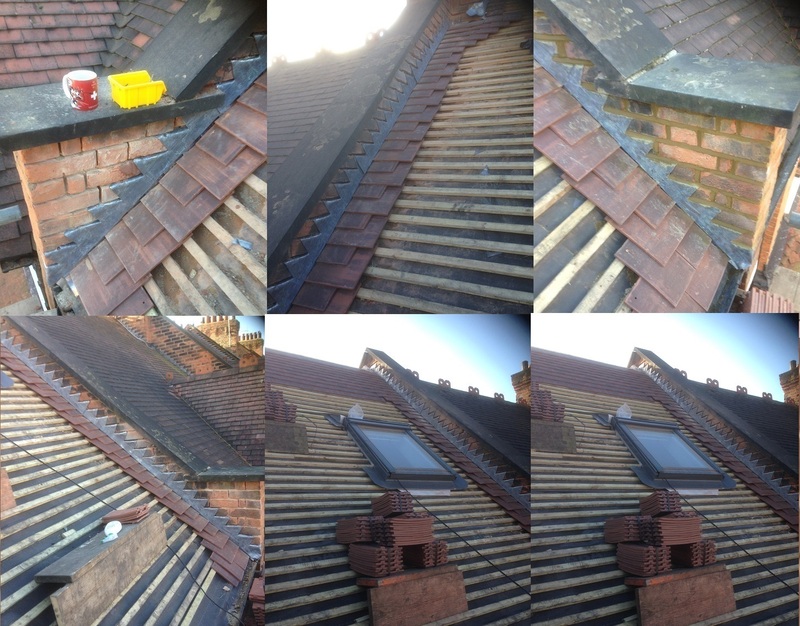 With all this carried out correctly our customers can be assured that there Lead flashing will last or outlast the roof, please view roof and flashing pictures below and call or email if you require a free quote and advice on any roofing flashing or any of the other services we offer. 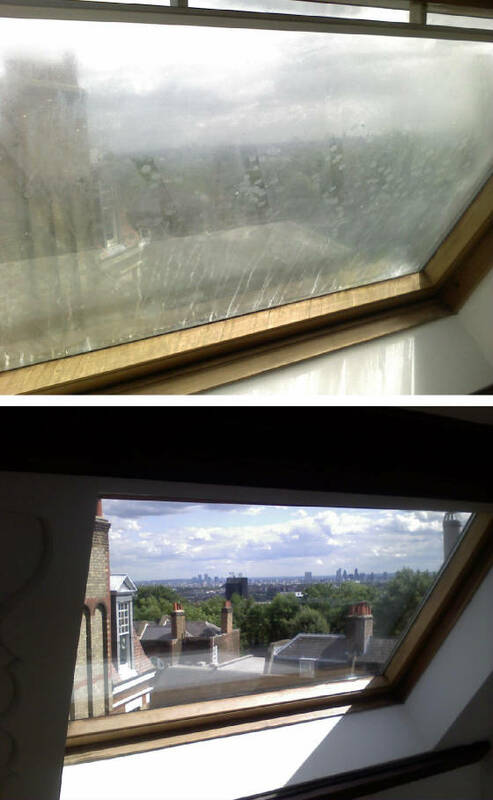 Roof Valleys: Roof valleys are another common problem with roof leaks, the roof valley is a point where two roof slopes meet like a dorma or an angle in the building which could be an extension etc. again roof valley's are made of many materials Lead, Zinc, Copper, Felt, Fibreglass and I'm sure many more. 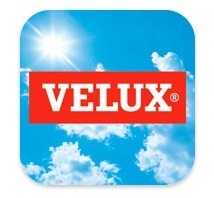 The best quality roof valley is always thought to be Lead because of its long life and durrability but the main draw back is cost and if there are lots of valley's to be installed like a building site Fibreglass or Zinc are often used. I alway recommend to my customers when we are installing a new roof not to skimp on this area of the roof and go for the Lead because being a colletive place the valley where water collects it can be a nasty problem if it leaks in the future and needs replacing. 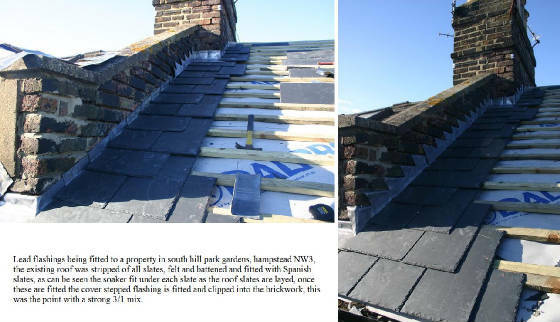 Replacing roof valley's is more difficult with slate roof's as the slates are nailed and we need to use a special tool to free the slates to get the old valley out and fit the new valley, once the new valley is fitted the slates are re-fitted and clip in place. With tiled valley's the tiles can be lifted and the valley replacement carried out, when the tiles are relays and cut to the valley if needed it will require cement to be pointed between the valley and tile to seal the gap and again this should be a strong 3/1 mix. LEAD FLAT ROOF: Many bay roofs, small dorma's and gutter valleys us Lead, mainly these roofs are on public building or are listed, due to the expense many private properties opted for the more cost effective and practical option of high performance felts, Lead roofs will give a very long life span but has to be weighed up against the cost etc. Roof flashings are one of the main causes of roof leaks, the job of roof flashings are to form a sealed bridge between two abutments ie Roof and Wall, this can be parapits walls, dormas, roof window, flat roofs, chimney stacks and many more. One of the most common cause of a roof leaks is when these flashings break down which can be caused by many factors.  Cement fillets, dentals and Lead Flashings: cement fillets are still on many properties and can form a good seal but the problem now days is with heated homes and shrinking timbers which cause movement in the roof which will lead to roof movement causing the dentals and fillets to move away from the party wall. Many years ago this was not a problem and the roof would be layed to the wall abutment and a cement fillet would be tilted at a 45 degree angle to roof and wall, this would often have tiled coloured dentals layed into in to make the same colour as the roof. This type of seal would work very well until the roof moved which would then crack the fillet away from the parapit, chimney stack etc and cause water to penitrate down the wall and into the property. This problem with roof fillets has been overcome by the introduction of of roof flashings, although roof flashings are mainly Lead there are also Zinc flashing, fibreglass flashing, felt flashing and probably more which I haven't used. The Lead flashing type is by far the most popular choice but of recent time with the high price of metal and the possibility of theft other materails have started to be used like fibreglass etc. 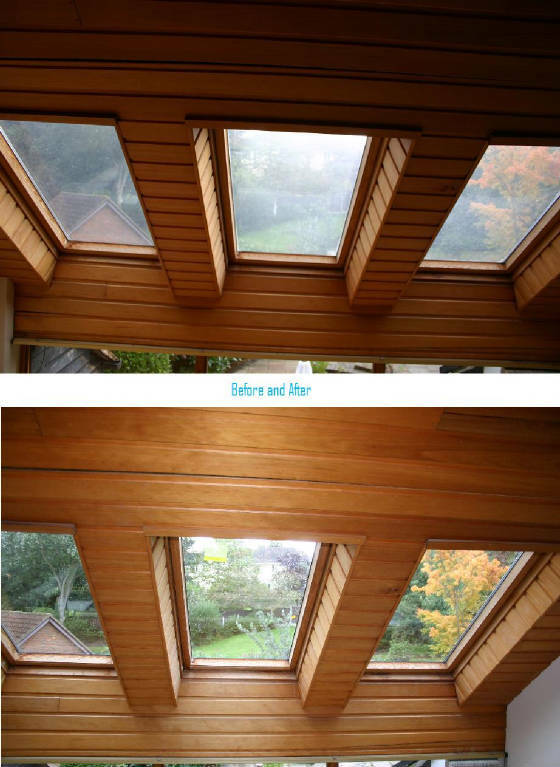 The main benifit of a roof flash is that it is attached to the wall but not the roof allowing the roof to move without breaking the flashings. 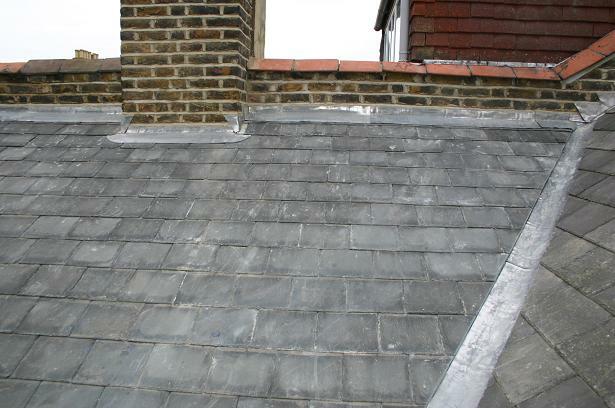 Slate flashings and flat tile flashings employ the help of soakers, these soakers are layed on each tile or slate as the roof is layed to stop water traveling down the back of the slate or tile as it travels down the roof. The the cover flashing is installed, this is chased into the wall either straight or stepped into the brickwork, they both offer the same protection but if the brickwork will allow stepped flashing look far nicer and more traditional and is the one I enjoy doing most as it is nice to admire your work, Instalation of these is by first chasing out either with a grinder if straight or by hand if stepped. Normally for this 6" or 7" Lead would be used which would be cut into 4ft length then cut to steps and each step bent to go into brickwork joint by min 1 inch, this is then Lead clipped or nailed if possible, dressed to wall and pointed with a strong 3/1 mix. With high metal prices the theft of Lead flashings has become common place, with alternative Lead the fact that the materials used have no scrap value make it very practical for places of easy access, often the value of the lead is not the problem to the property owner but the damage it causes and the labour replacement costs are. Alternative Lead is not cheaper at the outset than real Lead flashings but give that is has no scrap value it has no attraction to the would be theft making it a very attractive viable option for Lead flashing replacements and renewals. 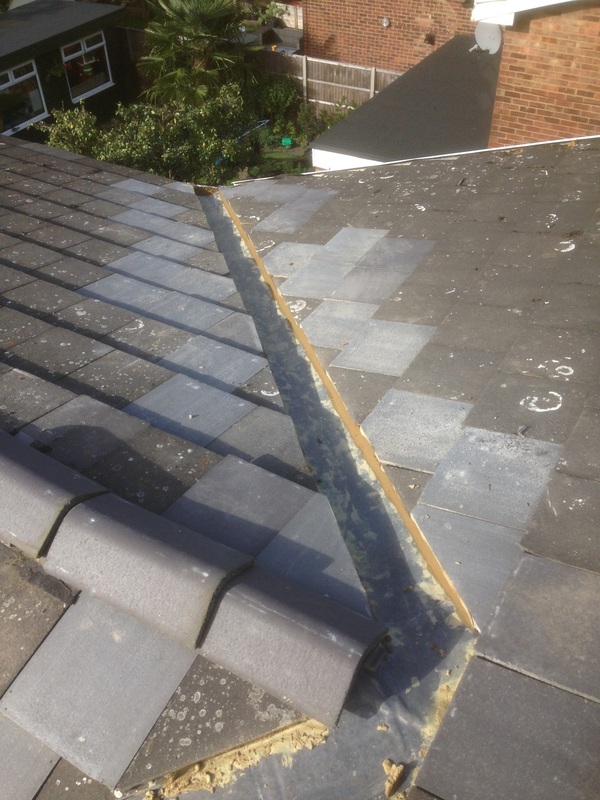 The alternative Lead acts and works in the same way conventional lead flashings work and can be installed in the same time giving the same appearance as lead roof flashing, it can be cut for stepped and straight flashings just the same as lead flashings and can be used for all flashing repairs. Today with sky high metal prices Lead theft has become very popular, although it is imposible to completely protect against this type of theft it can be made more difficult with certain measures, below is The Campus Church in Welwyn Garden City that was the target of Lead theft durring the summer where the Lead flashings where taken from the dormas.